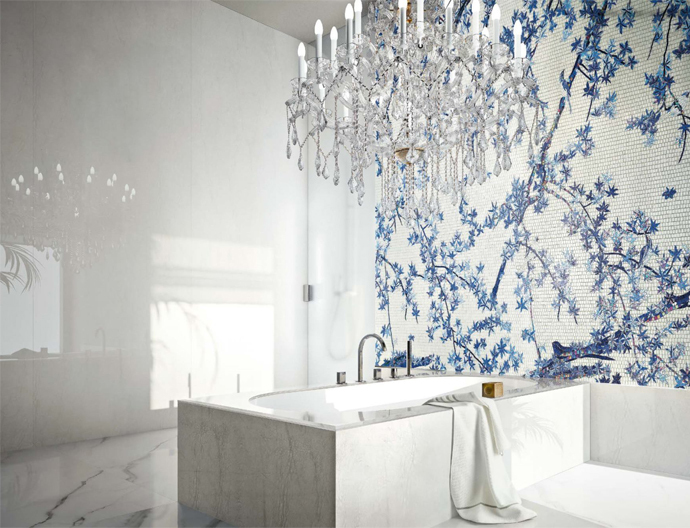 Bring a true splash of luxury and beauty to your bathroom by using breathtaking glass mosaic tiles to create an accent feature wall. Creating an accent wall can draw the eye to a certain feature of a room or away from a feature should you desire, they are a truly versatile medium and a great addition to any luxury development. 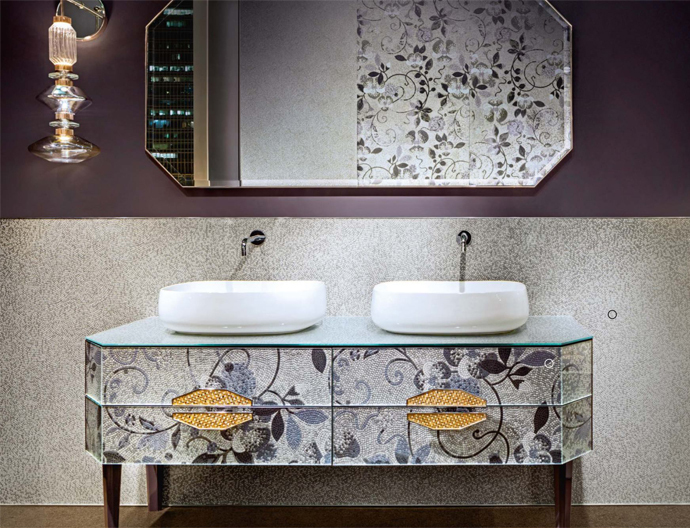 Using mosaic glass tiles as a luxurious embellishment to your room can add a unique detail to any high-end bathroom, use a bold design to stand out or promote relaxation and peace with a more toned down design, the choices are endless. Mosaics are a classic way to add luxury to any bathroom and with today’s materials and designs, you can create a modern twist on this classic luxury and create designs to tie together your room. An accent wall can be used to balance the classic and the modern elements of a bathroom, using the classical nature of the mosaic and adding a more modern design to your accent wall can make a room feel more harmonious in its style. At concept we work with top quality interior designers and creative brands, in order that you can be assured of a luxurious finish to your private client project or luxury development, using glass decors intricately create stunning visual walls and feature vanity furniture cabinets and can bring an aura of grandeur and style to any bathroom. 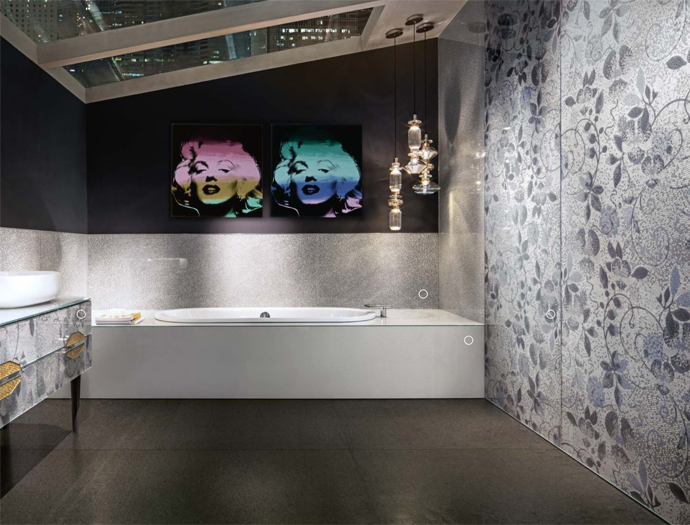 Accent walls that are created using glass mosaic tiles or glass slab finishes are the perfect way to add style and impact to any private client or luxury development, if you would like to know more about how we can incorporate specialist finishes into your bathroom project, please contact our design team or visit our specialist bathroom and tiles studio. Our in-house design team are available for consultations by appointment and are usually bought in at an early stage often before any of the building or refurbishment works have started. This entry was posted in Luxury Bathrooms and tagged bathroom designers ascot, bathroom designers virginia water, Beaconsfield bathroom design, Gerrards cross bathroom design, Glass Designer Bathrooms, Glass Mosaics, Glass Vanity Units, Hi End Bathroom Decors, Luxury Bathroom Finishes, luxury bathroom tiles, luxury bathrooms. Bookmark the permalink.